Without a doubt the main focus of our trips are the dolphins. Being a wild eco-trip we are at the mercy of the weather and the dolphins. Regardless of the season the ocean can be flat calm and sometimes there are windy, rainy and rough days. 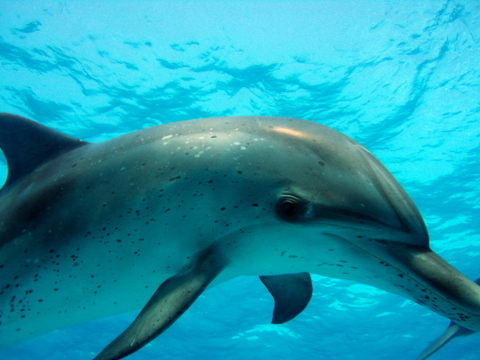 There can be several dolphin swims a day or one for the week or none at all. These are things that are out of our control but also leads to a sense of awe in our environment as the weather and dolphins come and go at their own pace. Sit back and take it in and feel a smile stretch across your face.We have been blessed and have never had a week without any dolphin interaction. The pod size runs from two to sixty dolphins and interactions can run from a few minutes to a couple of hours.Their interactions may range from playing with us in the water or surfing in the bow of the cruising boat, to feeding and taking care of their young. Over the last few years we have worked hard to figure out the best way to interact for both the dolphins and the guests. This has led to the dolphins making all the decisions: The only way it could be. 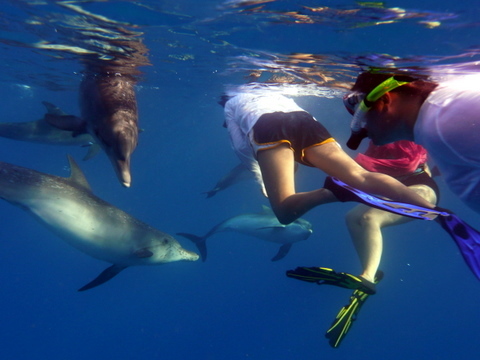 On our dolphin expeditions there is absolutely no touching or feeding of the dolphins. This is in line with the rules of International Dolphin Watch. The beauty of the Bahamas dolphin trips is that we meet dolphins that are wild, we meet them in their home and we are their guests. 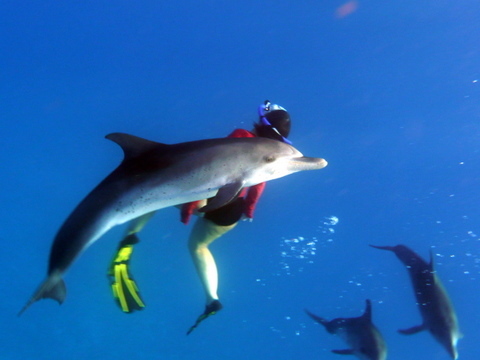 We work hard to ensure that the dolphin’s way of life remains as untouched as possible by the human presence. Even after over 40 years of swimming with these wonderful mammals Geoffrey Hanan is still working to refine and improve the quality of swims for both the dolphins and his guests. This has led to longer interactions both in and out of the water-with all choices being made by the dolphins. Geoffrey Hanan definitely does not condone certain behaviours that some operators use such as circling dolphins to attract them or when the dolphins have left the swimmers in the water, chasing them and jumping in again–the dolphins have made their decision and moved on. Also; we feel that putting 20 to 30 people in the water is counter productive to both the dolphins and the guests in many ways. We average 8-12 for a more intimate experience. When the dolphins have made the choice to join and interact with us it is a much more mellow, relaxed and longer interaction–we feel really blessed to be a part of it.